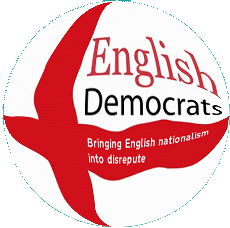 For years now the English Democrats' political brain, Steve Uncles, has harassed, abused and defamed countless people who don't support the English Democrats or criticise him or his party. Now he's bitten off more than he can chew with a post on his English Passport site calling his Green Party rival in the Police & Crime Commissioner election a Nazi, complete with mocked up pictures of him with swastikas. This is Local London, the website for 40 newspapers in the south east of England, reports that Green PCC candidate, Stuart Jeffrey, is "horrified" at the bile on Uncles' site directed at him and is seeking legal advice to have it removed and get compensation. When Uncles was contacted by a reporter he denied knowledge of the site but later said he was just a contributor to it after their chairman, Robin Tilbrook, told them it was Uncles' personal site. The site claims to have over one thousand contributors - a claim that can only be substantiated if you count the journalists who wrote all the original content that has been shamelessly ripped off from newspapers and blogs or the countless fake profiles that "like" him and the English Democrats on Facebook. What is quite astonishing is not that Uncles denied knowing anything about his own blog - it's owned by Passport & Associates (formerly Diamond & Associates) which is a company owned by Uncles and registered at his home address - but that Tilbrook tried to defend him. What Steve Uncles has done is over the top but at the same time it’s not without a kernel of truth. [...] One of the things we know about Hitler was that he was an anti-hunting vegetarian. Tilbrook is a solicitor and is responsible for churning out an endless stream of threats and defamation claims against anyone who criticises his party. He tried to sue me over a post on this blog last year and his case was thrown out of the High Court. Having lost his own defamation case this year you would think that he'd know that Uncles has been caught bang to rights and as a PCC candidate himself in Essex you'd think he'd want to keep this liability at arms length. With such consistently appalling judgement, you'd have to be a fool to vote for either of these jokers.